NOTE: If you have arrived here in search of Edward Mordrake (Edward Mordrake) photos, I’m sorry but no actual photos exist. The image that likely brought you here is a wax interpretation of Edward that was created long, long after his demise. Furthermore, the placement of his parasitic twin is near impossible and stands only as an artistic rendering. Of course, there is a very real kernel of truth to his story and there have been documented cases of two-headed boys, two-faced human curiosities, one-of-a-kind people and other unique individuals with unusual faces that you may find very interesting. Known as one of the most bizarre and most interesting cases of deformity is the tale of Edward Mordrake. The true tale of Edward Mordrake (Mordrake) has been lost to history. His unusual case occurred early in medical history and is referenced only in tales handed down. The tale of his life has become so muddled through the passage of time that no solid date of birth or death is evident to modern researchers. Is the story of Edward Mordrake true? The 1896 text Anomolies and Curiosities of Medicine mentions a version of the story and Edward has been featured in many texts, plays and even music as the Tom Waits song ‘Poor Edward’ is based on the story. However, the tale was considered false for quite some time. It was simply too fantastic to believe and, obviously, many parts of the story simply do not make medical sense – years of retelling warped what was likely a very real occurrence. How can one make the assumption that there is fact beneath this tale? Chang Tzu Ping was discovered in China in the late 70’s or early 80’s. Chang had been born with a second face consisting of a mouth, a malformed tongue, several teeth, a patch of scalp, and the vestige of other facial constructs. The throat and the lips of the second face could not move independently, but the mouth did react in tandem to Chang opening his. Shortly after being discovered he was brought to the United States to have the second face surgically removed. The entire case was documented – including the surgery – on the 80’s televison program ‘That’s Incredible’ – and yet there exists almost no secondary evidence of his existence. The operation was considered successful and Chang likely went home to his villiage to live the remainder of his life without his ‘devil face’. It does not require a great leap of faith to conclude that the tale of Mordake is based on some nugget of fact, perhaps he had something similar Chang’s condition – mutated by storytellers over time.Consider that the case of Chang Tzu Ping is relatively unknown despite only occurring a few decades ago or the strange tale of The Boy of Bengal. These are indeed very rare cases and the human mind has a tendency to classify the unusual as impossible – it often helps us sleep well at night. 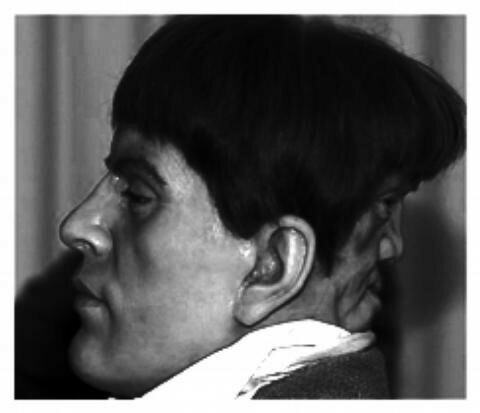 Although the medical term was never deemed in Edwards lifetime, many believe he had a condition called “diprosopus,” a disorder which causes certain parts of the human face to be replicated on the head. It’s extremely rare, but there have been some known cases . There have been some known cases not only in humans, but in cat’s as well. There is a recent story of a pair of babies that were born with the disorder. Sadly, the twins passed after birth. Diprosopus is known as a very dangerous disorder. It’s very extraordinary that someone like mordrake possibly lived with it in the 19th century and survived to be twenty-three years of age. In 2001, Spanish writer Irene Gracia published Mordake o la condición infame, a novel based on Mordrake’s story. Tom Waits wrote a song about Mordrake titled “Poor Edward” for his album Alice (2002). Edward Mordrake is shown as the “Two Very Special Cases” on a list of “Ten People With Extra Limbs or Digits” in the 1976 edition of The Book of Lists. A United States thrilling film named Edward Mordrake is in developement currently. A future release date has not been given. 3 episodes in the FX anthology series American Horror Story: Freak Show, “Edward Mordrake, Pt 1”, “Edward Mordrake, Pt 2”, and “Curtain Call”, show the character Edward Mordrake, played by Wes Bentley. A short film based on the story of Mordrake entitled Edward the Damned was released in 2016.
image: Janus twin drawing based on Edward -Unknown Artist. 2. Still of Chang from ‘That’s Incredible’, 1982.